In this series of blog posts, I will explain our current understanding of spacetime using the notions of relativity. Special relativity originates from two simple principles but its predictions challenge our day to day experiences. For instance, according to the relativity, a person in the train station will see the the length of a moving train a little smaller than that of stationary train (of same type). Furthermore, the same person will notice that the clocks hanging in the train ticking little slower than that on her wrist. These phenomena are termed as “length contraction” and “time dilation”. The magnitude of these contractions and dilations depends directly on the relative velocity of the train and the person standing on the platform. Now, commonly, the relative speed of train is so low that one doesn’t see any appreciable changes. Cosmic particles which travel at very high speeds are known to have longer half lives than their laboratory counterparts. But convincing the audience that relativity is a correct theory of the nature is not the purpose of this post. Assuming that relativity is a valid theory, the aim of this post is to describe and discuss the theory. In my opinion, special relativity is all about the properties of spacetime in fairly small region and how various observers record the events occurring in that spacetime. The words in italics have precise definitions and meanings in physics so let us spend some time in understanding them. When you read the word spacetime you might think of it as a three dimensional space with time as separate entity running in the background. This is totally a wrong picture of the spacetime. If you are a physics major, and have had a course in relativity, you might think of it as a strange mixed space of and with 4 coordinates in which the invariant path length is given , where is the speed of light. Thus, when an observer is assigning coordinates and to an event, he/she is basically mapping the events in to a space. When an observer assigns a coordinate system, he/she defines a frame of reference. So when we say “the frame of reference of the observer A”, we mean the coordinates assigned by A. In physics we postulate that all the physical phenomena, comprising of events, happen in this spacetime manifold. In order to quantitatively analyze them, we require an observer who can assign the coordinates to these events. First postulate of relativity says that the physics doesn’t depend on the coordinate systems of the observers moving with constant relative velocities with respect to each other. We call all such observers as “inertial observers”. It simply means that if we do the physics calculations using the coordinates of any inertial observer we will find the same results. This shouldn’t be hard to accept as the real physical phenomena take place in the spacetime manifold and no matter which map (coordinate system) we use for quantitative analysis, we must find the same physical results. Now be careful! this postulate talks about the maps which are inertial. So we have to be careful when working with accelerated bodies. Vectors are mathematical objects (maps, to be precise) which, by definition, remain unchanged under the coordinate transformations. In relativity, we have 4 dimensional vectors living in the spacetime manifold which remain same in all the inertial coordinate systems. We call such objects as invariants. In fact there is a class of invariants called “Tensors” and we assign all sorts of physical objects (energy-momentum, electromagnetic field etc) to the tensors as they, too, don’t depend on the frame of reference. 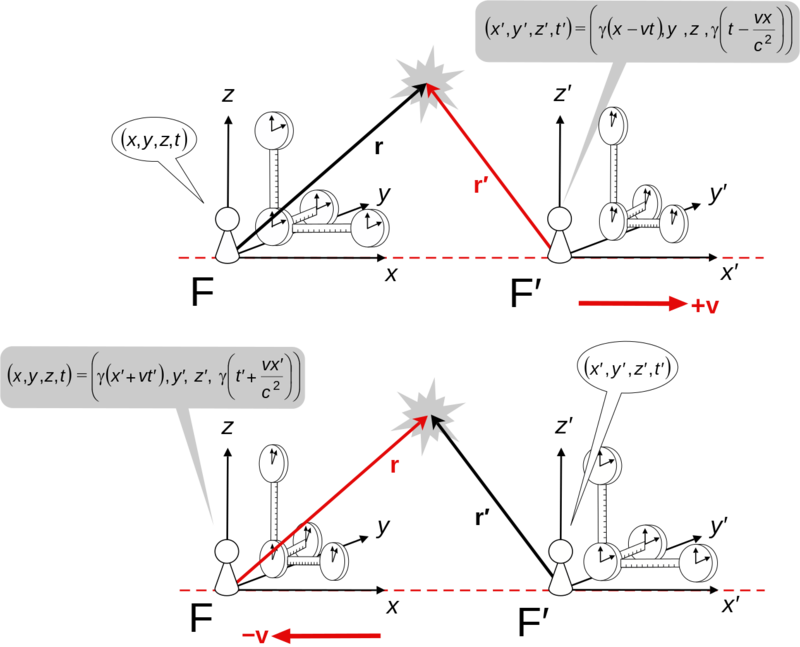 Now events, which are also physical objects, are assigned to 4 vectors. The distance between two events is called the “path length” and is a very good example of an invariant (actually it is a scalar which is a tensor of rank ). The second postulate gives us a prescription to make scalars, in terms of what is known as metric. According to this prescription the squared path length is mapped to in a coordinate system constructed from and . Here is a constant introduced to match the dimensions of the length squared when multiplied by . Simple analysis shows that it must have the dimension of . In another coordinate system with the coordinates and the squared path length is mapped to . Note the same constant has been used to maintain equality of the frames. Now, due to the invariance of path length, . This is the starting point of the derivation of the Lorentz transformation in the standard relativity textbooks (although they arrive at this expression using light rays which is misleading sometimes). The Lorentz transformation is a relation between the coordinate systems of two inertial observers, assigned to the same events in the spacetime manifold . Here . When physicists did the experiments they found that the value of the constant is nearly meters per second which is the speed of light. The derivation of these transformations can be found in any standard textbook on relativity or in Wikipedia (https://en.wikipedia.org/wiki/Derivations_of_the_Lorentz_transformations).